Ivy House Garage, Press, Shropshire. Homepage. This page: Work is done to a couple of vehicles in May 1940 at this Shropshire garage. Despite the difficulties often encountered with running a car during WW2, not least getting hold of petrol especially if you didn't have an urgent need of transport, clearly H.D. Jones of Ivy House Garage in Prees, Shropshire, was still getting business. In addition to car repairs "properly executed", cars could - in theory - also be hired from them, although if this was printed in the years leading up to the war, then I'm sure the situation had changed somewhat by mid-1940. To get an idea of date, the illustration shows a late-1930s Standard, probably a Flying 12 or a 14, examples of which may be found on this page at OCC. Ivy House Garage was an authorised agent for not just Standard cars, but also Austin, Hillman, and Vauxhall, while a selection of used motors could also be found on their forecourt. In this instance, the billed work was for a set of spark plugs, and ignition work done to both a tractor, and also a Buick car. 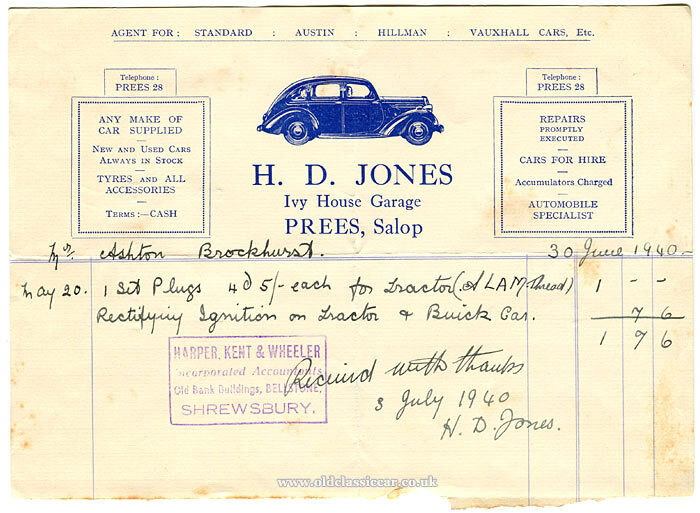 A good number of invoices and receipts relating to old garages feature on the site. Most of these garages have long-since disappeared, however that's not the case here. Ivy House Garage, of Shrewsbury St in Prees, survives to this day, and is now home to Prees Auto Services. It doesn't take much imagination to picture how the garage would have looked in the 1930s and 1940s, thanks to the following Streetview image. Return to the Motoring Collectables section, where many other garage-related items may be found. A couple of miles away from Prees, in Prees Heath, survives another olde-worlde garage, in this case dating to 1928. See photos of that garage here.